Spend some quality time with fine couple spa in Nusa Dua. Our “Packages for 2” are perfect for partners, friends, colleagues, parent and child, you name it. 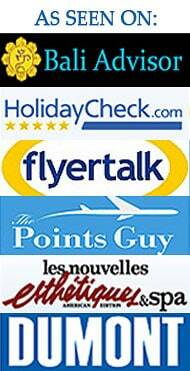 We can arrange these packages also for 3 or more people. 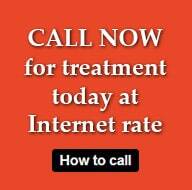 Treatment in private rooms, shady outdoor or air-conditioned, for single, twin and triple occupancy. Free pick-up & drop-back from/to your hotel In Nusa Dua, Jimbaran, Kuta, Legian, Seminyak or Sanur. Free airport drop-off available (please indicate when you place reservation). Balinese Body Massage is using thumb, palm, long strokes and kneading and sliding to cover and idealize tired and aching muscles as well as for preventive treatment to your body. As in all our treatments we use high quality massage oil. Shirodhara: warm oil poured gently on the fore head to balance the mind and nervous system. The oil streams down the “crown chakra” which magnifies the senses. Reducing stress and enhancing immunity as well as to improve health and vitality. Includes head massage. Enjoy an aromatic Flower Bath in a traditional stone tub after having massage. Countless fresh blossoms picked in our garden for your pleasure. Only the sky of Bali above you. 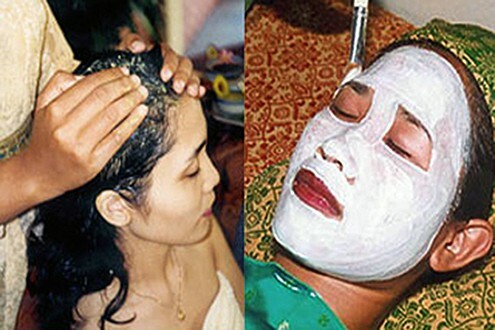 Balinese Facial with face massage, the royal Balinese beauty care treatment to pamper your face. Fresh local products like avocado, cucumber, lemon, exotic fragrant flowers, honey, egg white and bangkuang are commenly used in this treatment. That promotes the skin to become fresh and smooth, protects from dryness and keep moisture. Traditional Hair Cream Bath to tender all the muscles of neck and shoulder as well as to nourishing the roots of the hair and to give vitality to the hair by using fresh aloe vera and hibiscus. Includes a lot of massage for head, sculp, neck and shoulder.